I've been having a debate with an FTI member on Facebook regarding Macaulay. This debate can't be resolved in one blog post so I'll begin with a part of it first. "I have travelled across the length and breadth of India and I have not seen one person who is a begger, who is a thief. Such wealth I have seen in this country, such high moral values, people of such caliber, that I do not think we would ever counquer this country, unless we break the very backbone of this nation, which is her spiritual and cultural heritage, and therefore, I propose that we replace her old and ancient education system, her culture, for if the Indians think that all that is foreign and English is good and greater than their own, they will loose their self esteem, their native culture and they will become what we want them, a truly dominated nation.” – see image below. I received this first in December 2006, conducted some research and concluded that this is false. So before I revert to the main debate and assess Macaulay in a wholistic manner, let me first dispose off this image and quote (above). This material is patently false. Also see the bottom of this Wikiquote page – it explains the potential origin of this false quotation. What does the minute actually say? My remarks below are derived from a reading of the minute. 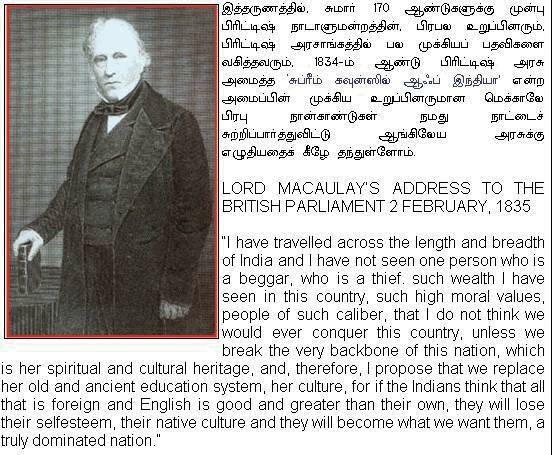 Macaulay was perceptive of Indian skills and capabilities and market needs, and argued in favour of what Indians demanded, namely more of English and less of Sanskrit. He did not force English down our throats. Indians were paying serious money to be taught English and that was the reason he felt Indians needed to be taught more English. Those who were taught Sanskrit came to the government begging for jobs – they were entirely useless for any practical purpose, even then. In 1835 he discussed the Charter of 1813 which laid aside "A sum … apart 'for the revival and promotion of literature, and the encouragement of the learned natives of India, and for the introduction and promotion of a knowledge of the sciences among the inhabitants of the British territories.'" – a subsidy for Sanskirt and Arabic. The 'ghastly' East India company was subsidising Indian languages even in its early days, once the corrupt times of Robert Clive were over. He argued cogently, and in my view successfully, that "the natives are desirous to be taught English, and are not desirous to be taught Sanscrit or Arabic". He also extolled the capabilities of Indians to pick up English very well: "it is unusual to find, even in the literary circles of the Continent, any foreigner who can express himself in English with so much facility and correctness as we find in many Hindoos." He proved that England needed to increase education in English and stop subsidising Sanskrit and Arabic. Under no circumstance did he allege anywhere that he wanted to break the backbone of India. That is a very mischievous piece of false propaganda indeed. Lord Macaulay apparently wrote this in a letter to his father, Oct 12 1836: "Our English schools are flourishing wonderfully. We find itdifficult,–indeed, in some places impossible,–to provide instruction for all who want it. At the single town of Hoogly fourteen hundred boys are learning English….. The effect of this education on the Hindoos is prodigious. No Hindoo, who has received an English education, ever remains sincerely attached to his religion Some continue to profess it as matter of policy; but many profess themselves pure Deists, and some embrace Christianity It is my firm belief that, if our plans of education are followed up, there will not be a single idolater among the respectable classes in Bengal thirty years hence. Andthis will be effected without any efforts to proselytise; without the smallest interference with religious liberty; merely by thenatural operation of knowledge and reflection. I heartily rejoice in the prospect." I'll deal with this and indeed, the entire Macaulay contributions, in a separate blog post. The first thing I've got to do is to check the authenticity of this extract. I've now uploaded the scanned extract from the original minute (published in 1876 by Macaulay's nephew), here (2.2MB). See my FB post here. This entry was posted in Liberty, People and tagged in Falsifications and myths, Macaulay. Thanks Sanjeev for the discussion on Macauley. One of the most reviled figure in, ironically, English speaking Indians. superhuman power to meticulously plan the future of millions of people. He was a paid employee of British empire and like most employees he spent more time remembering his old girlfriends than the job at hand. His achievements and his loyalty to British empire is grossly overrated. 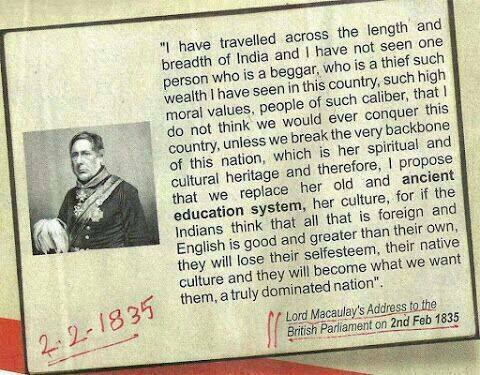 possible that English got imposed on India due to Macauley. He was instrumental in bringing English education in India but aparently it was Indians who lapped it up so as to be able to land a coveted Government job. However, people who find faults with Macauley and try to paint him as a chief architect behind deterioration of Indian languages, are just looking for scapegoats to hide their incompetence. Half of my life has gone into hearing/reading/watching about how bad British were and how they destroyed our country…remaining half was spent in improving my English. Claims like British took all of our Gold and all of our wealth are silly. Yes, their trading policies had serious impact on our economy some 50 years ago but we need to keep things in perspective. We have more gold in India than any other country. We have more money coming in from Britain and US than British ever took away (probably even after considering inflation). IMO, British gave us more than took away from us. They might have taken Tea and Indigo and gems and cotton but they did introduce us to industrialization and gave us the buildings that are still standing (with our labor, of course). Macauley is said to be staunch Christian and so his dislike for idol worship is understandable…Afterall, he was a child of his own time and not having religious biases are a fairly new phenomenon.